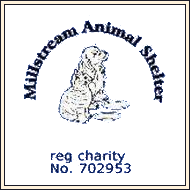 Millstream Animal Shelter has been a registered charity since 1990, originally beginning as Molly Bird’s Animal Rescue, which was run out of the back garden of a small, private hotel in Ashton-Under-Lyne. In 1994, when this accommodation had become totally inadequate, we moved to Clayton Bridge after purchasing what had originally been a piggery and then a boarding kennels. It was then that we changed the name of the charity to Millstream Animal Shelter and started to look more like what we have become today. Since that time, we have been steadily upgrading our facilities whenever our finances have allowed us to do so. All of our outdoor cat pens have thermostat controlled heating, cosy beds, toys and scratching posts, which enable the cats in our care to have the best possible environment until they are rehomed. We find homes for around 850 cats each year. Cats that have been with us for over twelve months and, for a variety of reasons, have not managed to find a home, are released to become permanent resident cats who can roam free on our extensive grounds, as well as having access to our resident cats’ lounge and, for a certain few, our oldies’ conservatory. These areas are furnished with sofas and beds as well as all being heated so that the cats are always warm and cosy. Our resident cats are very popular with visitors and enjoy interacting with visitors and volunteers alike. Some of our resident cats have been with us for many years. We run a sponsorship scheme, which helps us to fund all of our permanent residents. For just £12 a year, supporters can sponsor individual cats, which will allow them to receive photos and updates of their chosen animal. Until recently, we would take in and rehome dogs at the shelter, however our kennels are in major need of rebuilding and the decision was not taken lightly to cease taking in dogs. There are now other much larger rescue centres in the area that are equipped with superior facilities to our own. Millstream still aims to help the dogs in the area in some way and as of 2018, we run a Millstream Assisted Walks Programme, which aims to help dogs who are struggling whilst out and about with their owner. A problem that can be challenging for some people is their dog’s behaviour whilst out on walks, and this can often make dog walks an ordeal for both dogs and owners. Millstream’s Assisted Walks aims to help owners to understand their dogs more and work alongside owners who are struggling to manage. If you would like to keep up to date with the dogs that are still in our care, please visit their Facebook pages, which are linked below. As of November 2018, it costs approximately £700 per day to keep our shelter running. This does not include any capital expenditure. We always have new projects and improvements planned for the future of Millstream.